HOBOKEN, N.J. (October 10, 2018) - Octapharma USA will present the first bleeding disorders community screening of Bombardier Blood during the National Hemophilia Foundation's (NHF) 70th Annual Meeting at 7:15 a.m., Saturday, October 13th at the Orlando World Center Marriott. The screening is exclusively available to attendees of the NHF Annual Meeting in Orlando, Florida. Bombardier Blood is a documentary film on the inspirational story of Chris Bombardier, who recently became the first person with severe Hemophilia to summit Mount Everest. 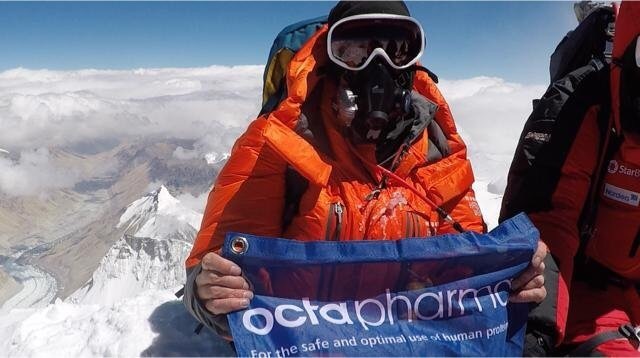 Octapharma sponsored both the film and Bombardier's climb of the historic mountain in Nepal. Octapharma also sponsored Bombardier's climb of Mount Vinson in Antarctica earlier this year, the final phase of his successful quest to become the first Hemophiliac to climb the Seven Summits, the highest peak on each continent. "We look forward to sharing Chris' incredible story with the bleeding disorders community," said Octapharma USA President Flemming Nielsen. "Chris' achievements have already inspired thousands of people in the bleeding disorders community to dream about their own Everest. It has been a privilege for Octapharma to support his truly unique journey." "I might be more nervous about this screening than I was to climb Everest!" said Bombardier, a Denver, Colorado resident. "Holding the first community screening at the largest community meeting of the year is such a perfect way to start sharing our documentary. I hope people who see the film find it inspiring and entertaining, but I also hope they learn a bit about Hemophilia in developing countries. As the film clearly shows, Hemophilia looks dramatically different in places like Nepal, where people with severe Hemophilia are lucky to live past 10 years old. It's important that our community here in the U.S. appreciates their access to care and treatment, that they continue to advocate to protect it, and that they do what they can do to help blood brothers and sisters abroad living without the predictable, sustainable care we enjoy here in the U.S."
Bombardier Blood Director Patrick James Lynch, a filmmaker with severe Hemophilia, said he expects the documentary will be released to the general public in 2019. "I've been looking forward to this moment for two years," said Lynch, who is CEO of Los Angeles-based Believe Limited. "To finally be at the stage where we're sharing Bombardier Blood and Chris' historic journey with the community is just unlike anything I've ever experienced before. It's overwhelming, in a good way. This screening at NHF kicks off a series of community screenings that Chris and I will be leading." NHF attendees are encouraged to visit with the Octapharma team at booth #8 to learn more about the company's advanced therapies and patient support services. Booth visitors will also have the opportunity to take part in "The Climb," a virtual reality mountain climbing game. To view or download the movie trailer for Bombardier Blood, please visit https://www.prnewswire.com/news-releases/octapharma-usa-to-present-first-community-screening-of-bombardier-blood-300727994.html.